To play Hogoword, you start by entering a four-letter word. Just about any four-letter word that you can think of will do. Use the direction buttons on your remote to select each letter, then press the Select or OK button to enter that letter. If you enter the wrong letter, use the reverse button to erase it. When all four letters are entered, press the Play button. Hogoword will respond to your guessed word with a yellow peg for each correct letter that is in the wrong position, and a blue peg for each correct letter that is in the correct position. But you don’t know which letters are correct, and the rest of the game is where the logic part comes in. After your initial word, you have six tries to enter new words based on the results of the previous attempt. It sounds simple, doesn’t it? Well, give Hogoword a try, and come back here an hour later to leave a comment on whether it’s really as simple as it sounds. You will probably pick up on the strategy of this game pretty quickly, but I’ll walk you through my most-recent winning game to give you an idea of my strategy. Mine is probably not the best strategy, but it did result in a rare win. The winning screen in the accompanying figure shows you the progression of my word selections. My thought process is outlined below. I started by thinking of a random four-letter word. I selected the letters to spell CRAB and hit the play button. Hogoword responded with two yellow pegs, meaning I had two correct letters, but they were in the wrong location. Next, I picked letters from my first try and put them into a word so that they would be in different locations. Any two letters will do, as this is a process of elimination at this point. I only had two correct letters, but I decided to use three letters from my first word, and I entered the word BARS. B, A, and R were the same as in the first word, but in different locations. Hogoword gave me one blue peg, meaning one letter was in the right place, but I failed to use one of the correct letters from the first try. The only letter not used in both the first and second words was C.
So now I know the correct answer contains a C. I also know that it contains one, and only one, of the following: B as the first letter, A as the second letter, or R as the third letter. I think up a few words matching these requirements, but most of them also use a letter shown in the first two tries to be incorrect. I decide to test the letter A to see if it’s the one in the correct position. Adding a C to that word, I try the word CABS. I know it’s wrong because S was introduced in the second word, but I got no credit for it, so S is not in the word. Again, this is a process of elimination, not just a guessing game. 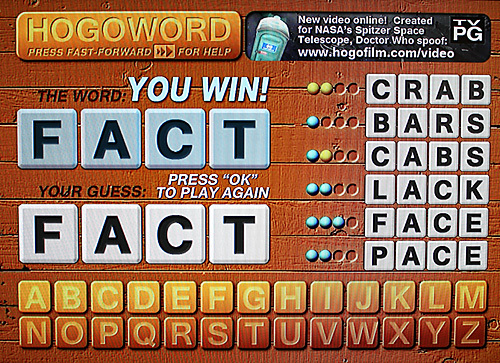 Hogoword responded to CABS with one blue peg and one yellow peg, confirming that A in the second position was correct. There is an element of luck here, as I could have instead picked a work with B in the first position or R in the third position. However, I was trying for common words that came readily to mind, and words with A in the second position seem to be in greater abundance in my vocabulary than the other options. Now I have A as the second letter and C somewhere in the word. What words can I think of that match these requirements but don’t use B, R, or S? Words ending in ACE or ACK jumped out at me. I chose the latter, added an L at the front, and entered LACK. The result was two blue pegs, so I got the A and the C in the correct positions for *AC*. Following my original instinct for either ACE or ACK, I decided to enter a word ending with ACE. It’s not LACE because I would have had three blue pegs instead of two. I try FACE. Hogoword responds with three blue pegs, so I’m almost there! What rhymes with FACE? I try PACE. Oh, no: I dropped back to two blue pegs! Okay, I was wrong when I thought the third blue peg on my fifth word was correct. My ACE/ACK instinct was wrong after all! If A and C were proven correct on the fourth word, and the E was proven wrong on the fifth word, then the F on the fifth word had to be correct. Now I have FAC*. I can think of only one word starting with FAC, and that is FACT. Hogoword tells me that I am correct. I won! As I said earlier, mine is probably not the best strategy, and I haven’t been playing long enough to have a lot of tips. If you have a winning strategy or helpful tips, please leave them in the comment section below.